In a story so shocking you might assume it was a late April's Fools, a garage attendant in Italy has crashed a customer's Ferrari through a wall. A Dutch couple were waiting for their supercar to be returned from a garage in Anzio, south of Rome, where it had been taken for running repairs. However, when the sports car was entrusted to a garage attended to return it to the hotel the owners were staying in he mistook the brake and the accelerator, ramming the £300,000 Ferrari into a shop front. The Italian car garage will have to hope it has a road risks insurance policy in place that can cover the cost of the damage. This type of insurance will enable garage and dealership workers to drive other people's cars, but a specialist road risk insurance policy might be required for sports cars due to their high value and large engines. 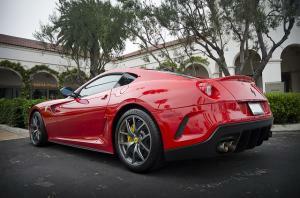 The Ferrari 599 GTO is capable of going from zero to 60mph in just three seconds, assuming there is not a wall in the way. Roberto Cinti, the unfortunate garage attendant driving the car, is reported by Corriere della Sera as saying: "I got confused – instead of the brake, I pressed down on the accelerator." Neither the name or the reaction of the Dutch car owner has been revealed at this moment but it has been reported that the incident is being investigated by an insurance company.